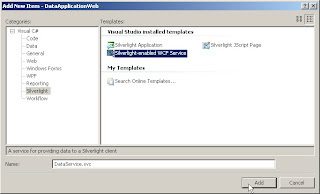 Before Beta 2 of silverlight 2, we needed some tweaks with the standard WCF service template to use it in our silverlight application. But luckily, the new Silverlight-enabled WCF Service template does the job lot easier for us. Now we just need to define our methods(marked with OperationContract atribute) in the service.svc.cs file and we are ready to consume it. No need to change the binding configuration to basicHttpBinding, no need to add ASP.NET compatibility support in special cases, no need to define method signatures in a separate contract file. Just use the new template and use the service in your silverlight application without any worries. It was a very wonderful experience. You can download my code here. Be sure to rename the file as a zip for extraction.